As a Toronto wedding photographer, I shoot weddings all over the GTA including locations in Burlington and Hamilton. For this wedding, the couple decided to have the first look on Brant Street Pier, which is a beautiful location for engagement and wedding portraits. Immediately after the unveiling we took a few creative shots and some formal photos. The unique pier is a perfect spot for romantic pictures with its lake view and the lighthouse design, which constitute perfect backdrops. For this shot, the bride and groom had a specific concept they wanted captured. The couple wanted a shot of the two of them looking towards the horizon. Once we created that picture I asked them to cover themselves with the veil and to hug. This is such a soft photograph of them they ended up printing a huge photo and hanging it on the wall. Light is the most important element in a wedding photograph and I took this picture around noon. That is the worst time to shoot outdoors portraits. However, by asking the bride and groom to cover themselves with the veil and positioning the couple between me and the sun, I managed to soften the light. 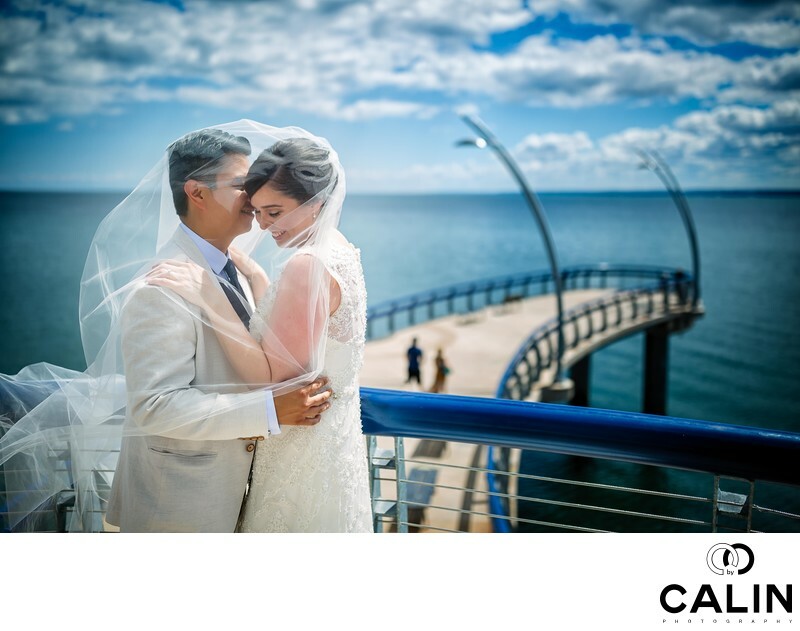 To create this image, I used a Canon 35 mm lens to capture both the subjects and the beautiful Pier and Lake Ontario. From composition standpoint I place the bride and groom on the left side of the frame. As such, the pier becomes a leading line that takes the viewer directly into the bride and groom, the subjects of this picture. The end of the pier visually balances the bride and groom giving the picture stability. And post processing I only enhanced the colours, opened the shadows and added a vignette to create a striking wedding photo. Location: 1400 Lakeshore Road, Burlington, ON L7S 1Y2.